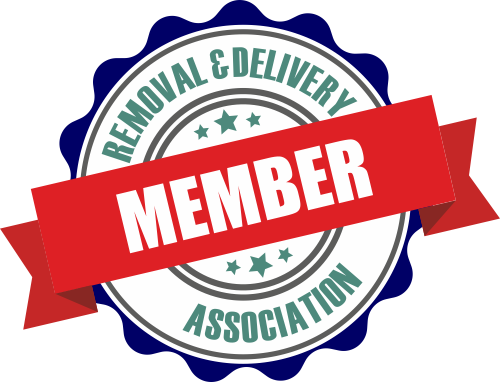 The simplest way to go through a quick and stress-free relocation is to delegate the organisation and execution of your property removal in East London to us. We are fully insured and certified man and van movers and we have a rich history of successful moving projects under our belt. During the years we have managed to maintain a 100% completion ratio and we believe that this simplest fact speaks immensely about our competence and professionalism. We maintain a large selection of diverse East London man and van services because we want our clients to know that we can cover all their needs from full property removals to single-item delivery projects. We also provide several side options such as waste clearance, storage solutions and end of tenancy cleaning services, so know that we can facilitate your life in more than one way. Note that if you combine any of our options into a personalised bundle you will lower your relocations expenses as you will take advantage of our amazing discounts. We have tailored our removal services in East London to be eco-friendly and this is why we use only reusable and recyclable protective supplies and energy efficient packing and lifting tools. You can learn more about us and book our man and van options by contacting our friendly customer consultants. Quite naturally, we care a great deal about your comfort and peace of mind throughout your moving day. That is why on top of the traditional man and van service in East London that you will get from us, count on assistance with a broad range of additional services to make your relocation experience smoother. For example, we maintain clean, well secured storage facilities at key locations throughout East London. No matter whether you want to put just a few items in storage, or your whole set of furniture, we will be ready to receive them. Long-term and short-term deals alike are possible, and we guarantee for the safety of your items while they are being watched by us. The key to a successful move lies in the people handling it. At Beuser Group we take no chances in that respect (or any, when we come to speak of it). Our man and van services in East London are delivered by a team of responsible and very capable professional movers whom we have vetted carefully so that we are a hundred percent certain to be able to handle domestic and commercial relocations of any scale and nature alike. The outstanding customer reviews that we receive on a regular basis clearly point out to the fact that we can be counted on in every situation. 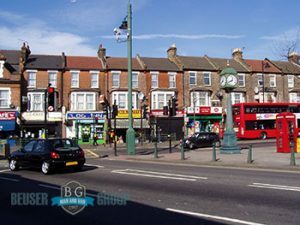 A man and vain East London coming from Beuser Group would be the perfect solution to not only full property moving projects, but also to store purchase deliveries and other small-scale relocations. We operate on a very flexible schedule so last minute booking can be arranged almost at all times. We want you to know that you can count on us a hundred percent no matter what. Furthermore, our trained and very capable staff has no problem working on weekends and bank holidays, if that is the best option for you. Feel free to call for more details and precise arrangements. We are seated in the sub-region of East London. The area covers the parts of the capital which are located to the east of the ancient City. East London is home to a number of world famous places of interest which attract travellers from all four corners of the globe. The Tower of London is arguably the most prominent landmark of the region. It is one of the four UNESCO World Heritage Sites are situated in London. The castle dates back to the late 11th century and was built by the order of William the Conqueror. Today, it serves the purpose of a museum and houses the Crown Jewels of the British Royal Family. It lies in close proximity to the Tower Bridge which is perhaps the most well-known river crossing not only in the United Kingdom but Europe as a whole. Furthermore we have access to a wide range of dependable and very well maintained transit vans – MWBs, LWBs and SWBs – that will accommodate the needs of your relocation fully. If you take the safety and the on-time completion of your move at heart, so do our experts. Opt for a man and van in East London coming from our company and you will not be making a mistake. Thanks to the efficiency of the tested methods that we employ in our day to day operations as well as the excellent methods and equipment that we use, we are able to maintain our prices low and affordable. The Queen’s Theatre in the district of Hornchurch in the Borough of Havering is one of East London’s most celebrated entertainment venues. It was opened during the mid-1970s and is known for its own productions and top tier learning and participatory programme which has over 11.000 applicants. It has a capacity of 500 seats. The Brookside Theatre is another well-reputed local venue and is one of the newest in the English capital as it was founded in 2012. It is located in the area of Romford and has a maximum capacity of 140 spectators. It happens so that East London is home to the district of Canary Wharf. Currently in the London Borough of Tower Hamlets, Canary Wharf was the location of the former East India Docks – home to thriving commercial activities of great importance for the United Kingdom. After the closure of the docks, this East London area become rather run down, but it was reinvented in the financial heart of the capital in the past two decades. East London is a very green area too. There are a number of pretty fine open green spaces where you can reconnect with nature without actually having to leave the city. The top among those are considered to be Springfield Park, Hackney Marshes, Tower Hamlets Cemetery Park, Mudchute Park & Farm on Isle of Dogs and of course the celebrated riverbank path that leads from the district of Stratford to Limehouse. We understand that you’ve got choices. However, when it comes to an exceptional man and van services in East London, no other company can match ours. We are unique because we really treat our customers like and care for them and their belongings. Whether you are moving house, a large corporate office or transporting household goods across the country, we promise you that you will be completely satisfied by choosing a leading moving company in London to manage your removal. Contact us for more info! Ensuring you have the right moving supplies and boxes to complete your next home or business move is crucial to the success of the move. You don’t have to worry about that because we’ve got you covered. We offer a wide selection of competitively-priced moving boxes and packing supplies to our clients, including tape, packing paper, markers, furniture pads, bubble wrap, stretch wrap, etc. You will feel calmer knowing your possessions are properly packed and safe during transportation. That is exactly what you will get if you hire a vetted man with a van in East London via us. Do you need a last-minute moving service? Don’t panic because we have our team of attentive and trained man with a van experts ready to provide needed assistance. They are great at delivering customised moving solutions to all our clients and completing them with minimal hassle and disruption. We are the right people to relieve you of the stress that almost always seems to accompany an emergency move. Leave all the planning and heavy lifting to the most reputable man and van in East London. 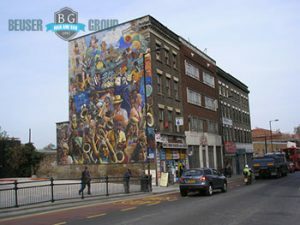 East London is one of the most popular areas in London for young creative professionals who are planning to move to the city. Despite the fact that prices in this part of the capital have been on the rise lately, East London in a cultural hub and one of the best places to live in London. Should you opt for Hackney, a place with the highest concentration of artists in Europe, or Forest Gate, ideal for families? Haggerston, Hackney Wick and Stratford are also worth considering.